These crustaceans are sorting into a tray then measured for length (mm), volume (ml), and mass (g). 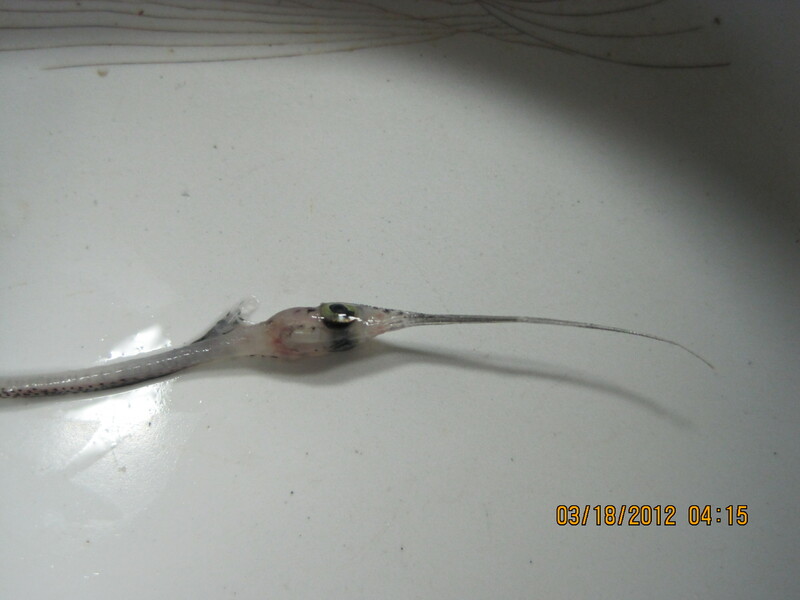 This coronet fish, in its larval form, was found in the Cobb trawl net. 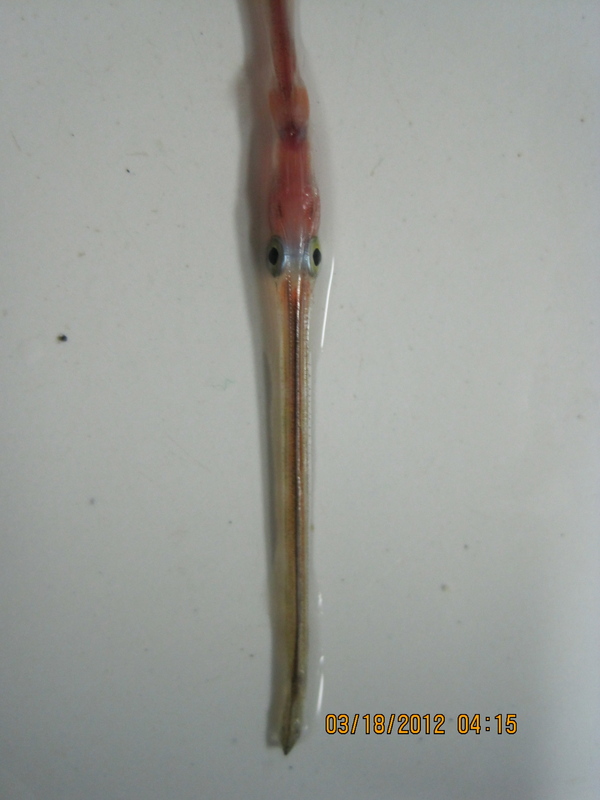 The snipe eel is one the longer fish we caught measuring 150 mm. The snipe eel mouth is shown close-up. 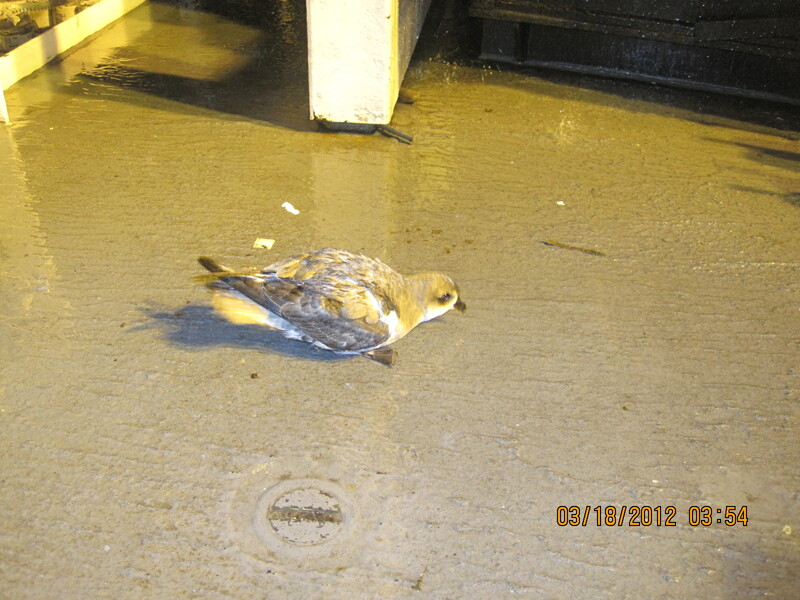 This fulmer bird landed on the deck of the ship during nighttime Cobb net trawling. “The Cobb Trawl Net” / With my week nearly over working on the Cobb Trawl Net, I asked the scientists to join me in writing some scientific poetry about the operation. The Cobb Trawl Net operation is overseen by John Denton and Aimee Hoover. The net is brought out of the water twice during the wee hours of the night, using a large noisy winch which certainly disturbs the slumber of those light-sleepers on the ship. Coinciding with the Cobb Trawl Net activities are nightly Plankton Tows. “I Wander Lonely as a Plankton” and “Plankton Mother” honor the various types of plankton and microplastics that Emily Norton and Louise Giuseffi are studying. We have been towing in different regions of American Samoan seas. One area is called 2% Bank. The other banks are called Northwest Bank and Southbank. “Myctohpids” / Since most of the bio-mass of the ocean is taken up by the little myctohpid fish, they are represented with an acrostic poem. The poems show a passion for science and the research being conducted here in American Samoa. I truly thank these scientists, John, Aimee, Emily, and Louise for their teachings, patience, and sheer enthusiasm for their scientific projects. The ocean’s toothy offering from the liquid, teeming abyss. Thunniform undulation and escaping through the gently rolling waves. Carefully each dish is filled for observation. …Mysterious dark organ on its tiny body? …Pointy sword-like structure on its rostrum? Yellow irises look with dreamy eyes like a glazed over donut. 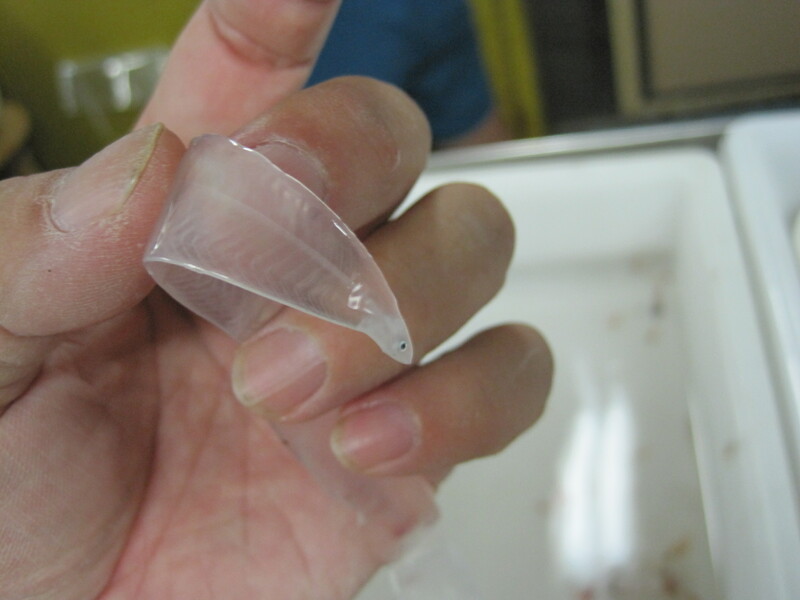 Clues to many different species found in the mesopelagic layer of the deep, ebony ocean. Schooling, synchronistic swimmers, tiny voices of light circumgloabally distributed around the world, cosmopolites. The day began on the Oscar Elton Sette with the small boat going Pago Pago harbor to re-fuel and collect supplies. That’s about the time I went to sleep. My own day started by waking up at 5:00 p.m. to rougher seas and unfortunately feeling a bit queasy. I took a walk outside hoping to get a bit of fresh air and relief. A gently rain fell as I peered over the ship’s railings. Thankfully the strong wind on my face helped my uneasiness. The first trawl began a 9:00 p.m. and the second at approx. 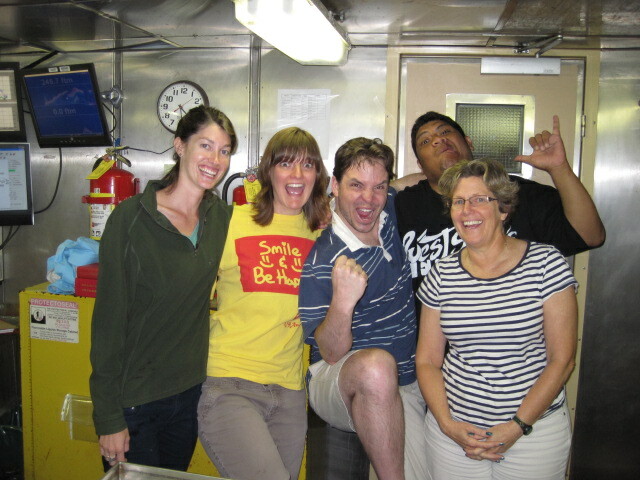 1:30 a.m.
Everyone teacher needs to be a NOAA Teacher at Sea to experience first hand the amazing work scientists do each day. It is now 11 :59 a.m. and time for sleep. So much excitement, so many fish, so little time. 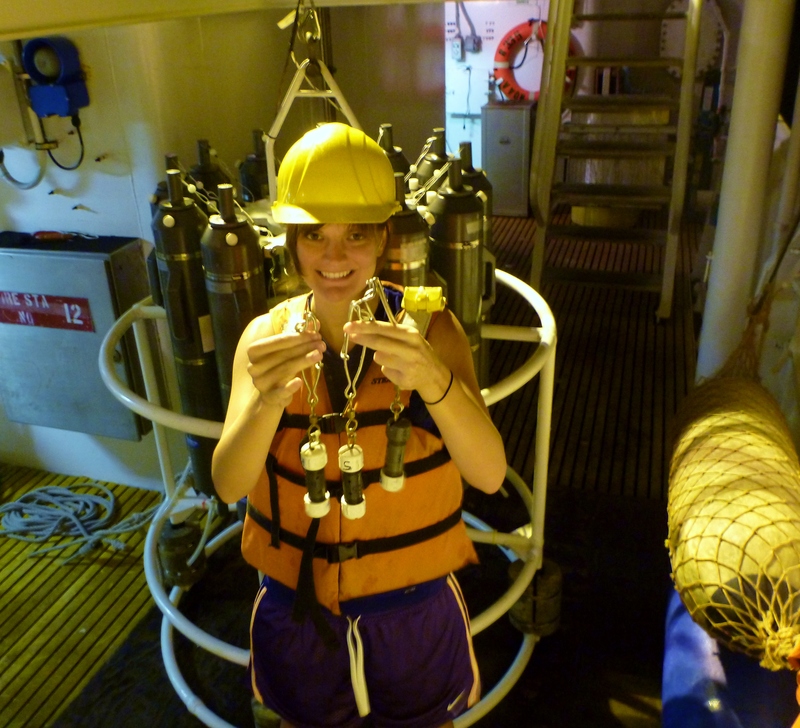 Scientist, Aimee Hoover is ready to input data from the midwater Cobb trawl which includes temperature and depth. 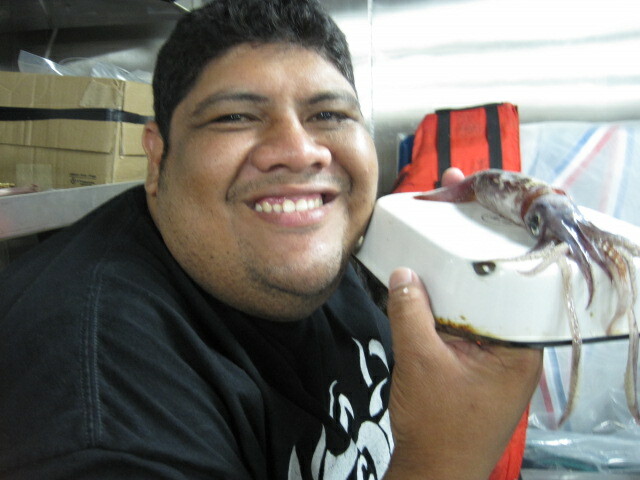 Pictured are American Samoan scientist, Sione "Juice" Lam Yuen and a squid found in the Cobb trawl net. Sione is ready to weigh and measure the squid. My current assignment aboard ship is helping the scientists with the “Nighttime Cobb Trawling” We conduct two trawls in the night, the first one beginning around 9:00 p.m. and the second one at 1:30 a.m.. After each trawl which lasts 2 hours, the nets are brought up and we sort the catch. 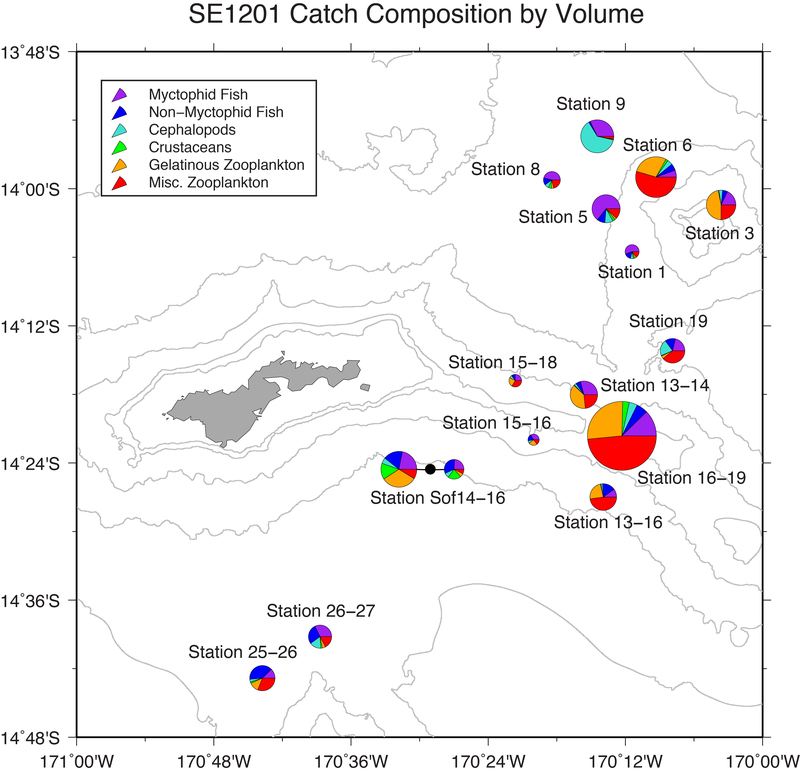 The scientists are looking for migration patterns and types of sea life in this region. Not much data has been collected in American Samoa. There are 3 other scientists working on this project. John Denton, is from the Natural History Museum in New York. Aimee Hoover works for University of Hawaii. Sione “Juice” Lam Yuen and Faleselau “House” or “Fale” Tuilagi are from the Fisheries Dept .in American Samoa. During one of the trawls the other night, they think they found a new species of myctophid fish. These fish have photophores which make them glow in the dark. They are anywhere from 4-5 inches to very tiny, 1 inch. 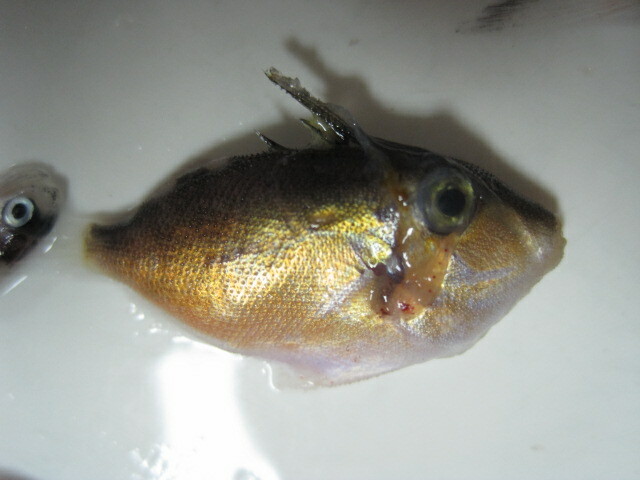 Myctophids are among the most numerous fish in the sea. They have specific light producing organs called photophores. After 4 days on the night shift, I’m getting into the groove. Going to sleep at 6 a.m. and waking up at 1:00 p.m.
During tonight's Cobb trawl a sharp-tailed mola was caught in the net. The crew and scientists aided in freeing the fish allowing him to swim away. Mola can reach 100 years old. When conducting a scientific experiment it is very important to maintain the same procedure or protocol. This allows the scientist to measure only that which he/she is interested in, keeping all constants the same. 3. Time the trawling for additional 30 minutes. 5. Cut away the TDR and Netminds tracking devices: Their data is read on the computer. Helping scientists determine temperature, depth for each trawl. 6. Working together, scientist and crew members collect the specimens caught is the Cobb net. 7. 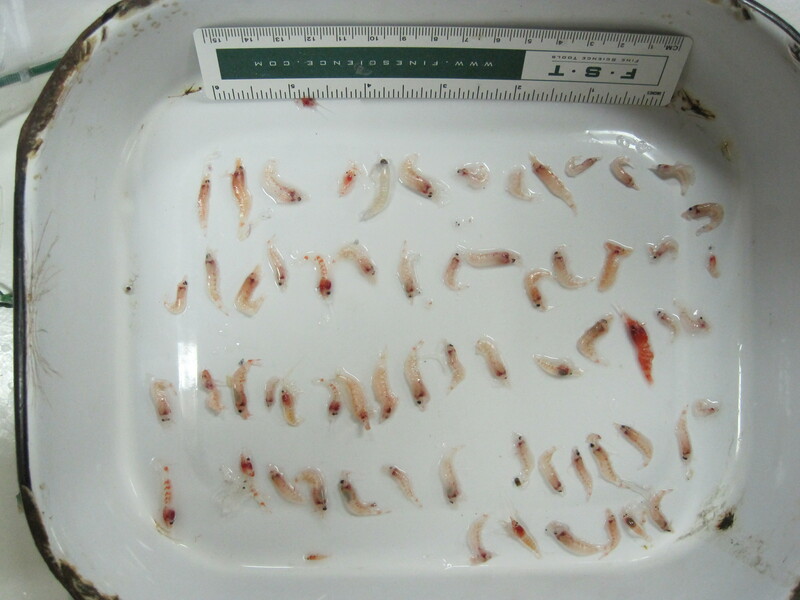 The fish collected are taken to the wet lab and strained into a net that is in turn poured into examining trays. 9. 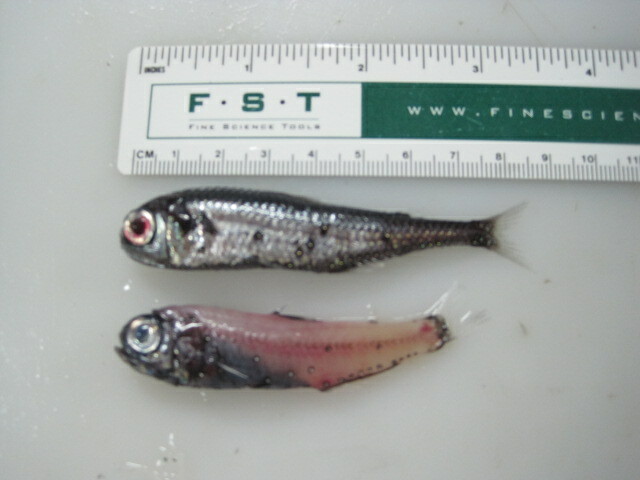 The scientists preserve each group of fish in ethanol/ ethyl alcohol which eases transportation and preserves the fish for further study back in the lab. I’ve switched to working the night shift, tonight being the third night. It’s getting a little easier, although we all still get punchy around 3-4 a.m. I am scheduled to work nights until next Monday. We will continue counting the fish, setting the trawl nets out, imputing the data, preserving the fish. All very interesting work. Two Moorish Idol fish were caught in the Cobb Trawl net. Their colors were brilliant including their unique dorsal filament. 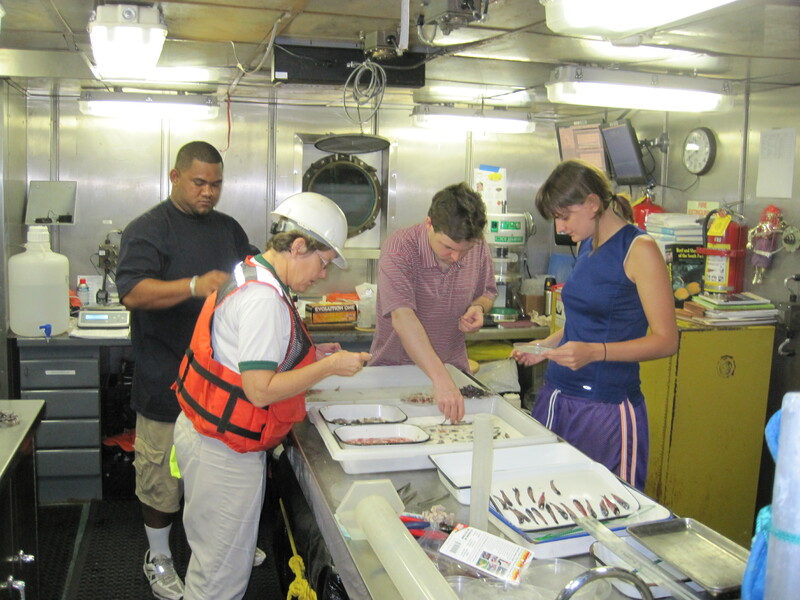 NOAA Teacher at Sea, Chris Monsour, assists in tagging a shark aboard NOAA Ship Oscar Elton Sette.